Description: RCIA is the Rite of Christian Initiation of Adults, and it is the place for people who are thinking about becoming Catholic. Meets in a church classroom. Contact Kathy Schmitt for more info. Description: Join us for the First Friday Evening Mass each month at 6:30 p.m. Eucharistic Adoration follows from 7:00 - 8:00 PM in the Rectory Chapel. Description: Lenten Stations of the Cross are held in the church. Description: The Lenten Penance Service will be at 7:00 PM, with opportunity for individual confessions with 4 priests. Description: The Charismatic Prayer Group meets in the church and welcomes new members. Description: Holy Thursday Mass of the Lord's Supper is at 7:30 PM, with adoration in church until 10:00 PM. Description: Outdoor Stations of the Cross will be held in the upper parking lot at 3:00 PM. In case of inclement weather, stations will be held in the church. Description: Good Friday Passion of the Lord Service is at 7:30 PM, with veneration of the cross. Description: The Easter Vigil Mass begins at 8:00 PM. The sacraments will be conferred on the RCIA participants. 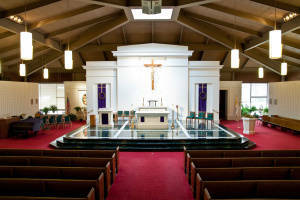 Description: The Sacrament of Confirmation will be held at 7:00 PM in the church. Presider is Bishop Roy Campbell. RCIA is the Rite of Christian Initiation of Adults, and it is the place for people who are thinking about becoming Catholic. Meets in a church classroom. Contact Kathy Schmitt for more info. Join us for the First Friday Evening Mass each month at 6:30 p.m. Eucharistic Adoration follows from 7:00 - 8:00 PM in the Rectory Chapel. Lenten Stations of the Cross are held in the church. The Lenten Penance Service will be at 7:00 PM, with opportunity for individual confessions with 4 priests. The Charismatic Prayer Group meets in the church and welcomes new members. Holy Thursday Mass of the Lord's Supper is at 7:30 PM, with adoration in church until 10:00 PM. Outdoor Stations of the Cross will be held in the upper parking lot at 3:00 PM. In case of inclement weather, stations will be held in the church. Good Friday Passion of the Lord Service is at 7:30 PM, with veneration of the cross. The Easter Vigil Mass begins at 8:00 PM. The sacraments will be conferred on the RCIA participants. The Sacrament of Confirmation will be held at 7:00 PM in the church. Presider is Bishop Roy Campbell.